Naomi Campbell is a British supermodel who belongs to the most famous celebrities in the world - though she also became known as a 'notorious' personality because of a series of legal issues. She has made appearances on many famous catwalks in the world & cover pages of internationally renowned fashion magazines. But she became also famous for her 7 perfume brands that were launched since 2000. Her appearance in Michael Jackson's video clip 'In the Closet' (1992) was an early milestone in her career as a model. Naomi Cambell is also known as one of the most violent female celebrities in the world. Actually, nobody appears to be safe! 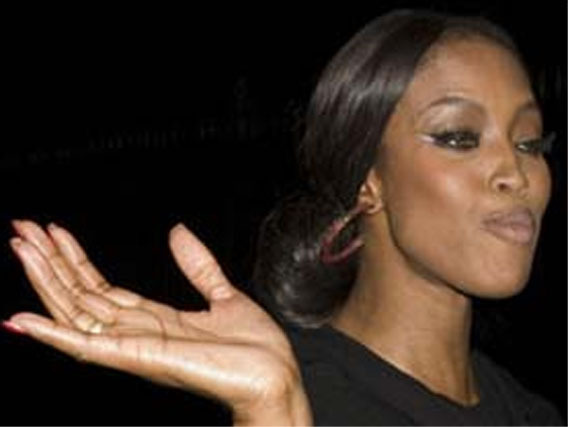 Naomi Campbell was arrested for quite a few assaults, including: a personal assistent (2000), a reporter (2004), her personal assistent (2005), multiple housekeepers (2006, 2007), and a police officer (2008). Recently (2010) she was was summoned by the war crimes trial against Charles Taylor at the UN-backed Special Court for Sierra Leone to give evidence on receiving a "blood diamond". Campbell admitted that she had received the diamonds - after meeting Charles Taylor, but denied knowing who gave them. 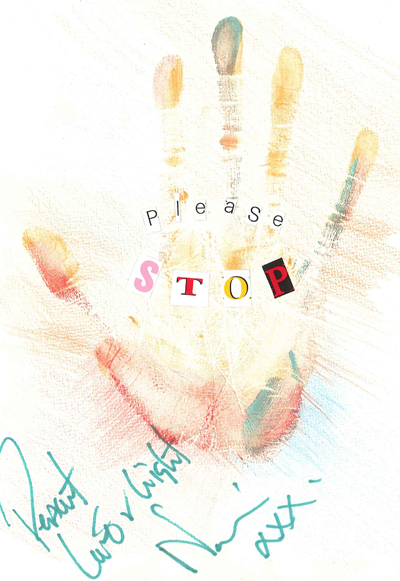 What are the most remarkable characteristic of Naomi Campbell's hand? Obviously, her beautiful, slender hands are a typical characteristic for a fashion model. What causes her continued violent behavior? Unfortunately the photos do not reveal very many details of her hands. 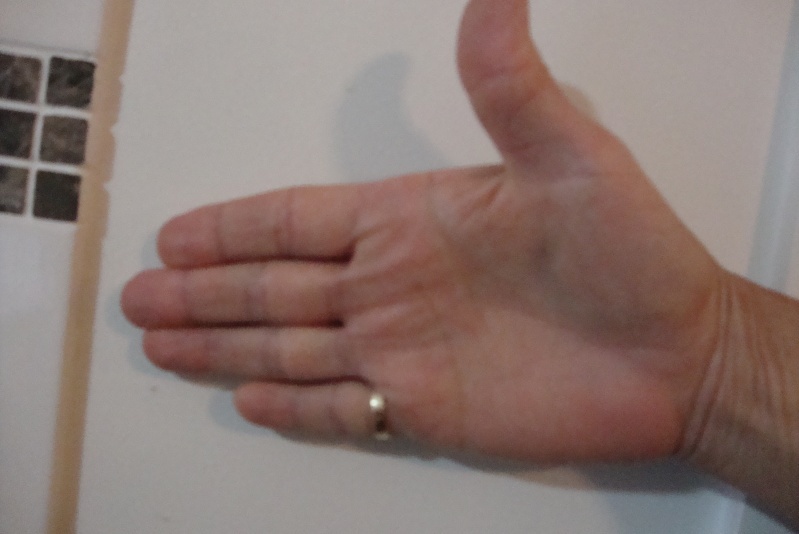 But the relatively large 'knuckle' where the thumb is inserted in the palm, could be recognized as a typical hand characteristic in an 'obsessive-compulsive personality disorder' (source: Holtzman's PsychoDiagnostic Chirology). By the way, these 'lines' have an Jamaican origin... (her mother was a balet dancer from Afro-Jamaican descent). Off-topic, but Naomi's 'lines' remind me to Grace Jones - who was born in Jamaica! Interesting!! Her 'digit ratio' appears to be close to 0.94 (which is low, even for a Jamaican female!). 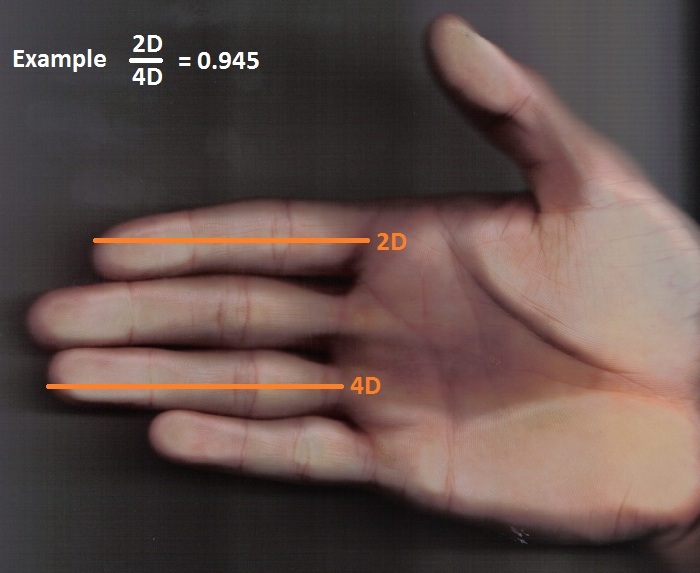 And since the low '2D:4D digit ratio' has been associated with agression... it explains part of her behavior problem! I noticed straight away that her index finger leans toward Saturn, (like mine) and i know this as an insecurity which is built in, maybe due to her early childhood (like mine). Anyway, what I'm really wanting to say is that the photos of famous people are often so very wrong! This is a fine example. . Her hand photo is taken sideways, showing a shorter index, but if you were to take this photo upright, it would show up different. 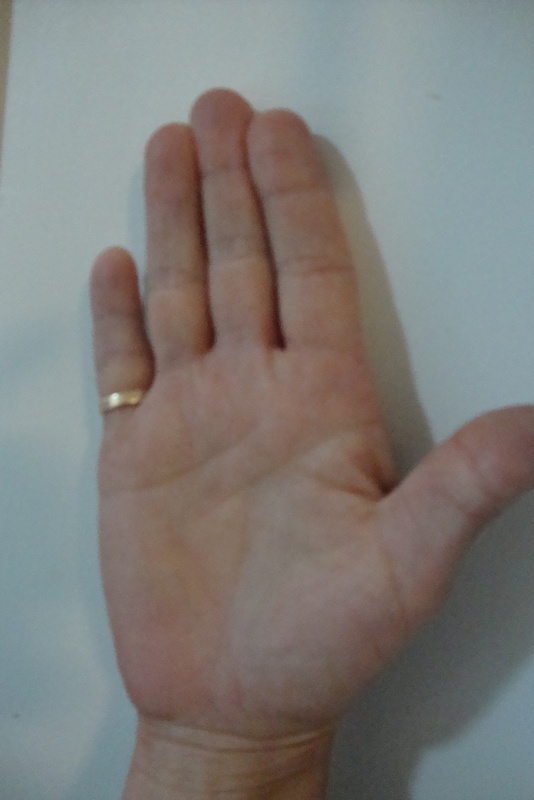 Let me show you the proof with my own images, I have taken a photo (now) of my palm sideways, and then upright. Can you see the difference in the length of my index finger? I don't believe this is an accurate way to analyze a person...My index doesn't look as short when held upright. the other angle of my hand shows a different view altogether! I have seen this happen many times, it depends on how you hold your hand as to how the fingers line up. You've raised an important issue that always requires to be considered: yes, hand photos are very often deceiving (especially regarding finger lengths) - therefore I always try to collect a few photos before making considerations. It does confirm with the hand held upright, and also the tip curving towards Saturn.